Each node has an input port at the top and an output port at the bottom. Some are blue and others are light-green or bright green. Light green indicates position and movement (transformation). 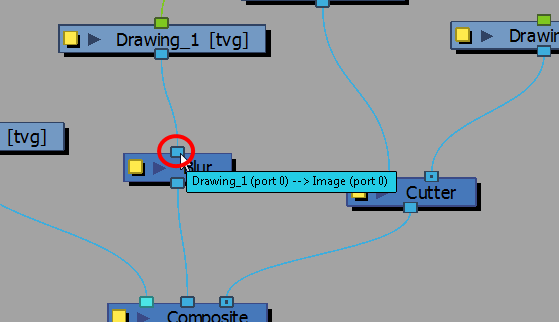 Bright green shows the element on top of the composition and outputs that element’s Z position to the Composite node. When many elements have different Z positions (multiplane, different distances from the camera) and are placed through a Composite node that flattens them together (producing one image with one Z value), the system needs to give a Z position to this new image. It uses the bright green port information. Finally, some nodes contain more than one input port. 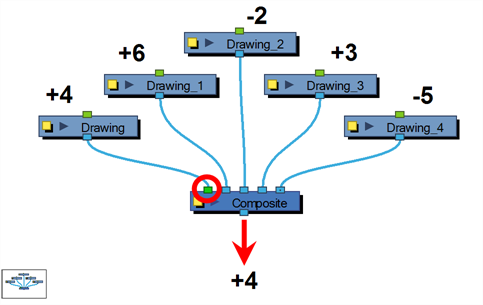 These are usually effect nodes needing different drawing or position information in order to perform their calculation. When the two ports are blue, the Drawing is on the right and the Matte is on the left. If it's light-green, the drawing needs extra position information. If you are unsure of the type of connection required for a node, you can click on the port itself and the port type will be displayed. On each port is a tooltip which displays the source of input ports and the destination(s) of the output ports (node names).